Der T-100 LT ist ein sowjetischer leichter Panzer der Stufe 10. Ein Projekt für einen leichten Panzer mit der T-100-Bewaffnung. Gemeinsame Entwicklung vom Forschungsinstitut Nr. 100 und dem GSKB-47 (Staatlichen Spezialentwicklungsbüro) Mitte der 1960er. Das Fahrzeug hatte eine gute Panzerung, die auf beliebige Entfernung 90-mm-Granaten standhielt (bei einem Frontaltreffer). The T-100 LT is a very, VERY small, fast, and nimble light tank, making it very stealthy. Poor gun characteristics prevent effective sniping, but it's ability to hide can negate that by allowing it to remain hidden at closer ranges. This tank is the final word in passive scouting. Der T-100 LT markiert das Ende seiner Linie sowjetischer leichter Panzer. The name of the game is staying hidden, keeping targets spotted for your team, and striking out when you know you have a clear shot. The T-100 LT is the ultimate passive scout, able to remain hidden far after any other tank would be spotted while keeping targets lit. One of the major advantages of this tank over it's medium counterparts is it's ability to maintain its camo value on the move, allowing it to slip into heavily vegitated areas unseen. This can allow it to take up positions far in advance of what most players would expect. While the T100's armor can provide the occassional bounce from time to time and seem tough compared to other light tanks, it is far from reliable. It is only a little less likely to bounce a round from a Obj 268 than it is a round from it's own gun. Do not count on the armor stopping anything. The only real let down of this tank is the abysmal gun accuracy, which combined with mediocre penetration (and low-velocity premium AP rounds) means engaging at long range is highly inadvisable, aside from very large and soft targets. Instead, use your excellent concealment values to sneak into positions that will allow you closer range and shots at the sides of enemy tanks. Just be careful of hilly terrain; your poor gun depression AND elevation will not be doing you any favors. One advantage to such a low profile is the ability to slip under the guns of some larger tanks, like the Maus, Type 5, or FV 4005, and hammer their sides with complete impunity, as they cannot depress their guns low enough to engage you. By the same merit, however, getting too close can limit or negate your ability to hit weakspots like copulas. When approaching an enemy tank, it will be important to know where you need to shoot it before hand, lest the only thing you do is hand out a Steel Wall to the enemy. None, as all modules are researched. In the mid-60s the Soviet Army Command decided a new low-profile airborne light tank was needed. Research Institute No.100 was assigned with the carrying out of the project. To put the basis of the new light tank, components and assemblies were taken from ChTZ's BMP Object 765. To create an easy-to-produce airborne and land tank, Institute 100 (VNII-100) took a classic layout with rear engine placement and the position of the driver in the compartment at the left side. 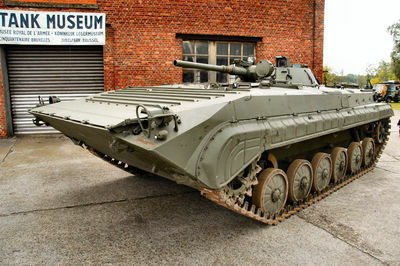 The design of BMP Object 765 propusion systems were used in development and, in connection with the new modified engine compartment volume (MTO) and a decrease in body height, undergone significant changes. The chassis (according to one schematic) was developed as semi-supported after the model of BMP "Object 765". The tank was to be transported by AN-12 aircraft and parachuted to landing. ChTZ's BMP "Object 765", basis vehicle of the T-100 light tank, that also became the BMP-1 later. In a joint operation with GSKB-47 (design bureau 162), under the command of L.S. Troyanova, preliminary layout study was held in preparation for the development of a primary weapon complex, which was to be carried out by head engineer A.A. Timofeev. It was comprised of a new 100mm active-reactive missile launching system with increasing cumulative projectile armor penetration at range, capable of being effective at 400m up to 1200m. 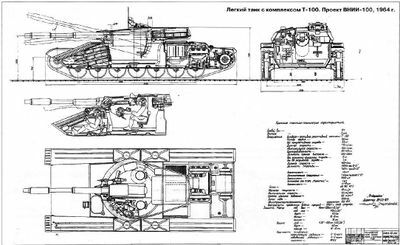 The light tank project, at this point, was given the designation T-100, also called VNII-100 project in blueprints after the institute name. T-100 1964 concept drawing by VNII-100 institute. The main benefits of the tank were the simplicity of the design and relatively low mass. The weapon complex was superior at point-blank range to any other light armor-piercing projectile guns of about equal volume/weight at the time. It could be installed not only on light tanks, but also on other machines such as infantry fighting vehicles and airborne support SPGs. Using the design of the T-100 light tank vastly increased the combat capability over the existing PT-76B tank, while maintaining reliability, low-cost and ease of manufacture and maintenance. The pressure of powder gasses in the barrel of the active-reactive system was significantly lower (2-3 times) than on other tank guns, being made according to the scheme of classic artillery shells while featuring reduced mass and dimensions. This made possible the use of automatic and small-caliber guns with complex tools for the armament of the T-100, as well as turret guns, which provided an acceptable mass and size of weaponry. Estimating the mass and dimensional parameters of other potential implements to the T-100 weapon complex, Institute 100 designers have come to the conclusion that the most appropiate weapon scheme was the six-shot turret gun. In this case, compared to the single-shot variant, with quite reasonable breech dimensions and gun weight, the combat characteristics of the weapon were significantly improved and many construction and layout issues were easier to solve. The loading mechanism of such a weapon was to ensure the automatic rotation of the drum after firing, with the help of an interpreter, which made the shifting of the drum possible. This device provides the simplest way to solve the matter of choosing one or another type of shell, as opposed to classical turret and barrel guns, in which the drum rotation was performed sequentially on a single type of shell. Such a design allows to always have in the drum loading mechanism different combinations of ammunition: six shots of the same type (armor-piercing or high-explosive fragmentation), or a combination of two types of shots (three armor-piercing and three high-explosive fragmentation). In both instances, the gunner provides automated consumption of all shells located in the drum. This type of loading mechanism provides the best possible readiness to fire the gun and independent choice for the type of shell, both unachievable in conventional systems. The mechanism minimizes the preparation of the first shot and provides almost instant readiness for the next shot. At the same time there was no need to install a hydrostop (with stabilized actuators) for the loading of ammunition. This, in turn, avoids a more simple and cheap system weapon stabilization and scopes with a dependent line of sight (type TS and TPN-1), and ensures no tampering at the time of loading and an independent stabilized scope. The use of a turret with blocks of breech nests made it possible to create a compact and comparatively light automatic gun with autonomous ammunition, with a high rate of fire. Reducing the time of preparation of the first shot was the most valuable asset for tank weapons, since by that time the time required to produce the first sighting shots depended substantially on the combat effectiveness of the whole complex of tank weapons. 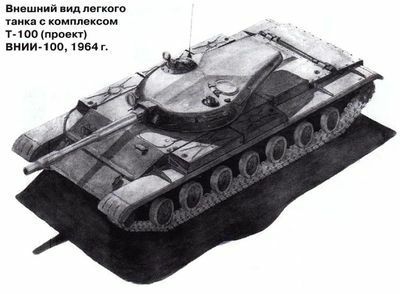 Abandonment of the buoyancy of the machine and the transition to a non-floating tank scheme with minimal transverse dimensions allowed to create a very powerful light tank as the armor and radiation protection of the frontal part was not inferior to the protection of other Soviet tanks at the time. 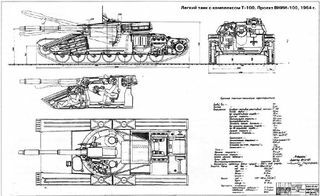 Interior schematics of T-100 light tank. According to the project, the hull was welded from rolled steel plates. The upper part had a combined frontal armor protection (steel + fiberglass + steel) with a reduced protective thickness of 430-450 mm. It provides protection against chemical NATO projectile guns of caliber 90mm and 105mm as well as from French anti-tank type SS-11. The front plate's big angle (68 °) allowed to provide protection against foreign armor-piercing projectile guns: 75 mm (AMX-13), 83.8 mm (Centurion) 90 mm (M48 Patton), 76.2 mm (M41 Walker Bulldog) at all distances; from the 105 mm cannon (M60 Patton and Leopard) at a distance of 300 m and from 120 mm cannon (Chieftain) at a distance of 100 m. armor plate sides and hull were 40 mm thick provided, at all ranges, protection from 20 mm NATO guns, installed on APCs. The roof of the hull in front of the steel was 16 mm thick, the roof over the engine compartment - 20 mm aluminum alloy armor. The bottom of the front and middle plate had a thickness of 16 mm, in the rear section - 6-8 mm. The equivalent thickness of a cast turret in the front sector combined with a ± 30 ° angle was 180 mm (155/30 °), side - 40-50 mm, roof - 12-26 mm. Despite the high level of protection of the light tank, its little cooperation level with bigger land machines and most importantly - the lack of buoyancy prevented it from being approved for production past the design phase. Light tank equipment and active-reactive systems also did not receive further development and development of complex weapons for the T-100 were terminated. The main efforts of specialized design offices have focused on the development of advanced amphibious tanks with artillery guns of a smaller caliber (85-100 mm). Work on the production of a light tank armed with a 100 mm rifled ballistic gun was continued in the 1970s by VgTZ design offices in Volgograd (Object 934) and CMH Kurgan (Object 685). Diese Seite wurde zuletzt am 7. August 2018 um 07:20 Uhr geändert.